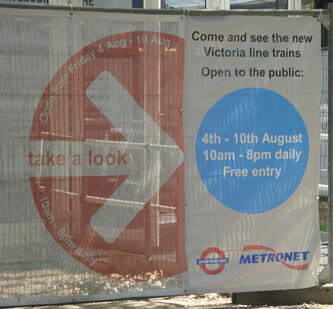 Yesterday I visited the temporary exhibition outside Euston station of the new Victoria Line Underground rolling stock which is due to make a debut on the line in late 2009. 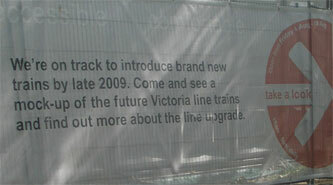 The display was in a marquee at the front of Euston, and featured a prototype of half of one of the new style carriages. What is it about the marketing material for these kind of events that forces people to use puns all the time? The prototype incorporates a great deal of work on the accessibility front, with colour contrasting designed to help the visually impaired, and various types of information systems. 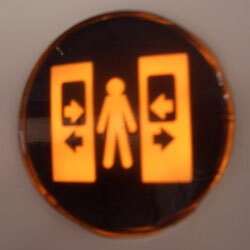 The closing of the doors will in future be announced and also signalled visually with lights by the doors. The new trains include cars that are specifically designed to be accessible to wheelchair users. 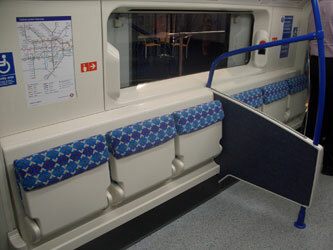 Flip-up seats are employed along one side of the carriage to allow either six people to seat or two wheelchairs. I think Victoria Line commuters will have to develop a new bit of tube etiquette. 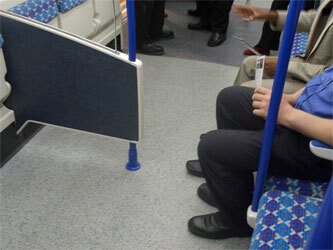 Should the seats be flipped up during busy periods to allow more people to stand? What if you start the journey in an empty carriage on a flip seat, but then the train progressively gets busier - should you stand up? Some rolling stock on the Paris metro has these type of flip-up seats by the doors, and when visiting there the stares of the Parisians leave you in no doubt about when it is time to flip them up - London will have to develop something similar. Whilst I was on the carriage it was being discussed by a member of London Underground staff - and they raised a concern about the back-rest for the wheelchairs protruding too far into the carriage. It does look like there will be very little space for people to walk by that barrier, especially once a couple of people are carrying luggage. I thought it was an excellent idea to put the new rolling stock on display, and I think my only real gripe would be that the exhibition was only open to the public for a handful of days, including just one weekend. By Martin Belam on 10 August 2006. The face of the train of my old line is not that nice. You guys should've do the face like the Picaddilly Line and the windows are too small. You should've done two windows. I liked the Victoria body the seats are ok. I used to live in Walthamstow off Black Horse road and now i'm in Leyton I left Walthamstow in May 1984. 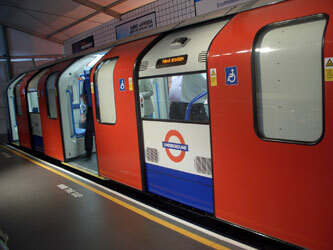 For the Central Lines, you guys should've put the 1967 stocks on the Central Line tracks too.